Neighbours had heard a woman and a man arguing loudly for the past few days in a Woodland’s HDB block. Yesterday, it ended with the 41-year-old woman dead and a 34-year-old man arrested for murder. Police received a call for assistance at 1.34am and found the woman lying motionless inside a room in a rental flat. She was pronounced dead at the scene. The male suspect was also arrested at the scene. The victim and suspect knew one another. The man is due to be charged in court today with murder. Police investigations are ongoing. The residents of Block 693D told The Straits Times that they’ve heard frequent arguing between them 3-4 days before the alleged murder. The woman is believed to be a school teacher. 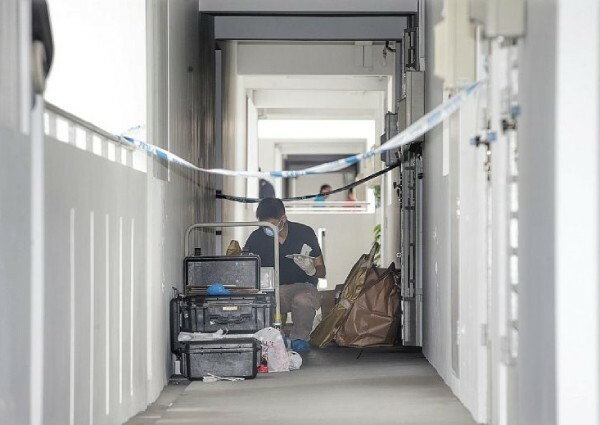 Mr Daniel Hussain, whose 12th-floor unit is almost directly above the crime scene, told ST that he saw the bald man, dressed in a red shirt and shorts, inside the victim’s unit yesterday. Mr Hussain had walked past the unit while looking for his cat, which had strayed from his home. “I’ve seen that man quite a lot,” said the 47-year-old resident. Mr Hussain added that at around 8.30pm on Wednesday, he heard a “scuffle” on the 11th floor. “I heard (the sound of) things smashing on the ground, it was very noisy. According to Chinese daily Lianhe Wanbao, the victim was found to have bruises on her hands, feet, face and eyes. It is believed she was beaten before her death.